Alexia Franklin, 16, wants to fight cybercrime. Samuel Goode, 13, wants to use technology to reduce child poverty. Ceon Duncan-Graves wants to make life easier with 3D-printed things. What kind of things? 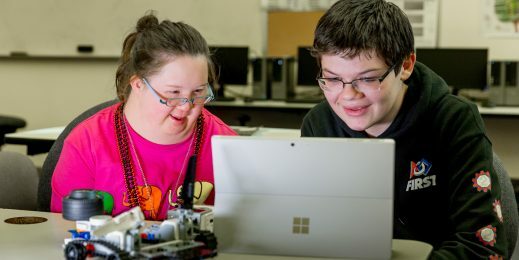 The students were among roughly 80 teens at a day-long STEM exploration event at Microsoft’s Redmond campus Wednesday, where there was no shortage of big ideas and passion for STEM (science, technology, engineering and math). Microsoft partnered with Seattle nonprofit iUrban Teen for the day of technology immersion, which included a diverse group of speakers from Microsoft, the White House, Yale University and “Grey’s Anatomy.” Students also toured the Microsoft Envisioning Center and The Microsoft Garage. “One of the great things about technology is there’s lots of opportunities. There’s opportunities at big companies. There’s opportunities at small companies,” Tony Prophet, Microsoft corporate vice president of Education Marketing, told the students. STEM jobs in the United States are projected to grow by 17 percent from 2008 to 2018, but African Americans, Hispanics and Native Americans are under-represented in the field. Deena Pierott, who founded iUrban Teen to help close the gap, said the visit to Microsoft was an eye-opening experience for many of the youths. Many had never been to a big tech company before. “A lot of our youths of color don’t have the opportunity to be exposed to different career paths. So we try to create that spark by showing them an eclectic mix of things and see professionals that look like them,” said Pierott, who was honored by the White House in 2013 for her work with iUrban Teen. The group is now based in five cities. Prophet introduced his path to Microsoft by starting with his mother, the first in her family to go to college, and his father, who went to college on the G.I. Bill. Prophet’s dad went on to earn a doctorate degree and become the superintendent of Portland Public Schools. Financial aid helped Prophet enroll in Kettering University in Michigan, where he earned an engineering degree before going to Stanford University. “The only reason why I’m sharing this is to say: There’s no magic. There’s nothing special. There’s no silver spoon. There’s no private schools. Just simple focus on discipline, study, education, hard work,” he said. The event also included live Skype in the Classroom sessions with Jason George, an actor with “Grey’s Anatomy,” and Khalilah Harris, deputy director for the White House Initiative on Educational Excellence for African Americans. Etienne Mashuli and Wendell Adjetey also spoke through Skype. The Yale University graduate students recently received a prestigious fellowship to open the first English language preparatory school and public library in Bujumbura, Burundi. For Geno L. White II, a 14-year-old middle schooler from Federal Way, the day was a chance to learn that many tech professionals have the same goals as him: Solve problems and help people.